Hear about the club from some of our members. Since learning to sail in my late teens I’ve been completely hooked and can’t get enough of it. So when I moved to Bristol 18 months ago a big priority was to find a sailing club and get out on the water. But having loved my previous club I was worried if I would find somewhere as friendly and fun – I need not have feared! I turned up on my own on a Saturday wondering with some trepidation if anyone would say hi. Unknown to me I was arriving just at the start of the ladies ‘lake and cake’ so was greeted by an enthusiastic bunch of about 15 ladies ready to spend a social afternoon sailing and then eat surprising amounts of cake. I got stuck in (to the cake that is!) and the rest, as they say, is history. Sailing with the ever popular laser fleet has been a great way to meet new friends and everyone has been extremely generous with their tips and advice – from how to stay upright more of the time, to how to get that elusive perfect race start. The annual laser fleet holiday to Rock at Easter has easily become the highlight of my year. The club racing is excellent but in no way intimidating, even for someone like me who is often trying to catch up from the back of the fleet! Wednesday evening racing in the summer is a real treat – knowing that if you dash out of work that couple of minutes early and ‘speed rig’ your boat you’ll have a beautiful evening sail followed by Rob’s amazing dinner in the clubhouse afterwards. But it’s not all been racing – from social Saturday sailing to family fun days or Wednesday evening talks in the winter there’s always been an excuse to get down to the club again. And with such a lot going on despite working shifts I never have to go too long before I get that ‘sailing fix’ again. Joining Chew has definitely been the best thing I’ve done since moving to Bristol – so give it a try, you might never look back! On one sunny summer afternoon six years ago, we stumbled into the sailing club and as luck would have it, bumped into an old friend, Reuben Woodbridge. Reuben grasped the nettle and showed us round- the convivial, friendly nature of the club was plain to see. So, we joined, albeit with a little apprehension. Jim was just fifty, Becky of an undisclosed, but younger, age! 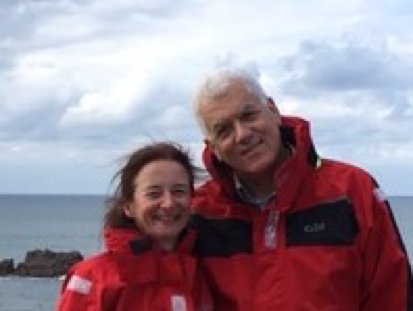 Becky has spent a lot of her life sailing, Jim less so but neither of us has sailed for a few years to any extent. The club boats combined with the help of friendly members got us on the water. A big question was what if we capsize? We surely did! -but all was fine with a rescue helm on hand. Jim embarked on an RYA course over three weekends. This was phenomenally good value for money which with banter and top-notch instruction improved his confidence no end. The Thursday evening improvers session and Saturday sailing got us in the groove. 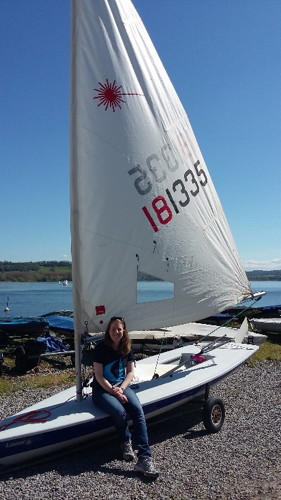 After a couple of seasons we bought our own boat- a Laser 2000 – great for a family which our teenage daughter Phoebe essentially learnt to sail in along with the club toppers (which are available on demand). The Laser comes up easy after a capsize – always an important factor for us “returners”! Galvanised by our experience we’ve now changed our Laser for a Wayfarer and are hoping to eventually start racing and to sail on seaside holidays. Also, we took the opportunity of doing the club-run, two-day Power Boat 2 training (again enormously great value for money) and both enjoy doing rescue boat cover. What we really like is the friendly, everyone “mucks-in” ethos of the club. The occasional Duty officer days are usually a relaxed “camaraderie” occasion and provide the opportunity to get to know other members. We both have demanding full time jobs and time is always a big factor -life is so busy! Sometimes we just go the club to chill out. There’s no better place to be on a fine summer afternoon – and to take family and friends for a picnic.